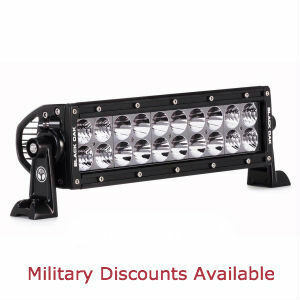 For just a bit more cost than a 17-Inch light bar, a 22-Inch LED light bar provides up to 30 percent more illumination. If you have the room in your vehicle’s grill, below the bumper or on a roll bar, the increase in light is often well worth the slightly higher price. It is often the case that a slightly longer light bar just plain looks better too. Whatever your rationale, we have picked out four of the best 22-inch light bars that are sure to please. Eyourlife’s 22-inch light bar is a solid performer using 40 high-intensity 3W Epistar LEDs to produce 9,000 raw lumens using just 120W. It is all housed in a deep-finned diecast aluminum housing with a shatterproof quartz lens. An IP68 intrusion rating means this light is waterproof, dust proof and trail-ready. You will love the rounded design and sturdy, corrosion-proof end bracket kits. This Eyourlife light bar gets an extra point for departing from the boring square-corner styling most light bars have by using fashionable rounded corners. The LEDs are 50,000-hour Epistar brand, which has a good reputation. A few buyers have had inside fogging despite the IP68 rating, so it is prudent to seal or re-seal the lens. Otherwise, buyers love the brightness and the heavy-duty end brackets. 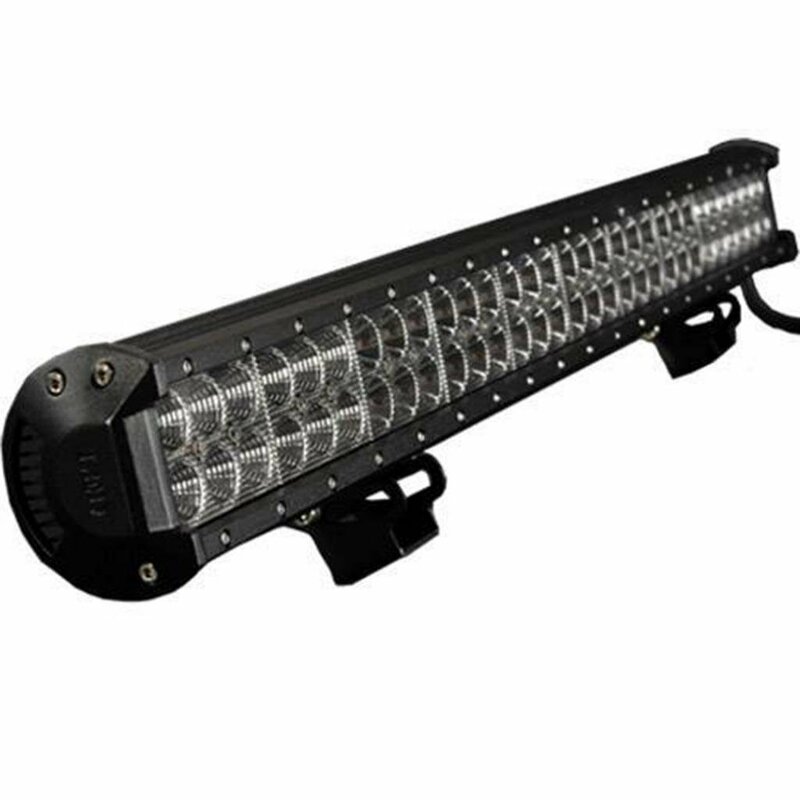 This is a well-built, economical entry in the 22-inch light bar class from Eyourlife. They have utilized good quality LEDs, have superior mounting brackets and improved the IP rating over their older products. All in all, this makes a great starter light with plenty of oomph in the brightness department. The Auxbeam 22-inch LED light bar outshines its competition using high-brightness 3W Philips LEDs and deep optic reflectors. It dedicates 80 percent of the LEDs to a deeply penetrating spotlight in the center section while still providing ample side illumination. It features an IP67 rating against moisture and dust, a rugged aluminum housing and full mounting hardware. 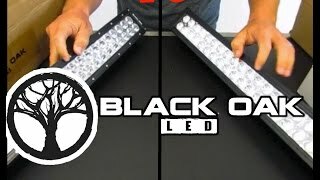 This is the only 22-inch light bar we review that uses Philips LEDs. These are exceptionally high-efficiency LEDs as you can see with 12,000 raw lumens of light and only a 120W power draw, but they only have a 30,000-hour rate lifespan. This bar is almost all spotlight with just four LEDs on each end dedicated to the flood function. No wiring harness is included, but it does come with end brackets and mounting hardware. Auxbeam has managed to pack a lot of gloom-busting light into a relatively small package using high-performance Philips LEDs and super-efficient reflector technology. 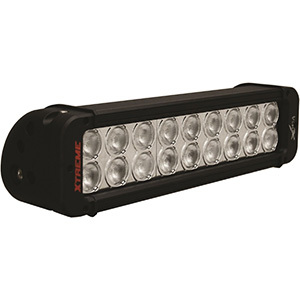 As such, this 22-inch light bar packs a walloping 12,000 raw lumens to set awash any road, trail, waterway or work site in bright, white light. It offers an excellent value. 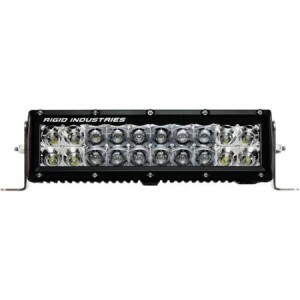 Penton uses 42 3W CREE LEDs in a sturdy, efficient, low-profile 22-inch light bar package. Adjustable, sliding, channel mounts make installation a snap in or on bumpers, grilles, windshields, roofs or tailgates. The flood/spot combo beam provides ample side illumination plus a long-reach spotlight from the center section. 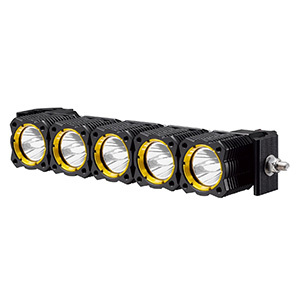 The LEDs are protected by a tough aluminum IP67-rated housing with integrated heat sinks. Sturdy end brackets and a rugged power cable are included. Inexplicably, Penton does not list the raw lumens rating of this otherwise well-specified 28-inch light bar. Given it uses 3W X 60 pieces LEDs, we estimate it is greater than 18000 raw lumens, however. Unlike others in its class, it provides much more side illumination with about a 50/50 split between LEDs dedicated to the spot and flood beams. You must buy a wiring harness separately. This light bar is the easiest on your wallet for this length while still providing night-busting illumination. There have been a couple issues with their customer support, so keep that in mind. 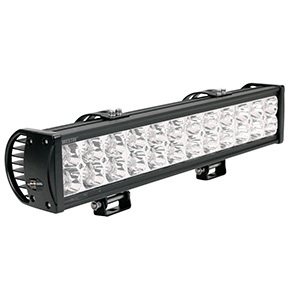 Otherwise, for the money, this 28-inch light bar provides plenty of power and is backed by a 2-year warranty. Mictuning wows their competition again with this fashionable, curved LED light bar that provides a whopping 12,500 raw lumens of dark-crushing light from 40 high-intensity 3W CREE LEDs. The Combo beam has enhanced side illumination thanks to the gentle housing curve with a deeply penetrating center spot beam that is difficult to outrun. An IP67 housing with integrated aluminum heat sinks and a shatterproof polycarbonate lens complete this sturdy package. A complete wiring harness is included. Do not let the budget-friendly price of this Mictuning 22-inch LED light bar fool you. This is a top-quality package that beats out its competition with style. First of all, it comes with a complete wiring harness including cable, fuse, relay, switch and an ample 12 feet of cable. The blue-lit switch is snazzy looking. There are hundreds of 5-star buyer reviews in love with how bright and good looking this light is. Given all the extras that come with this 22-inch light bar, such as the full wiring harness, curved design, long warranty and exceptional luminosity, it represents the best value in its class hands down. It even has a decent installation and user manual. A 22-inch LED light bar is a popular size as it fits so well in most vehicles. It is even small enough to mount as a portable light for work or camp sites. In this length, there is plenty of room for manufacturers to provide both spot and flood beams that are truly distinguishable. 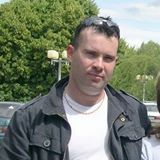 Still, they are not so big that their look overpowers your vehicle’s appearance nor do they require a huge current draw. Overall, this is a very convenient and affordable size.